Untold millions of unwanted cars leave America's roads every year. The real crime is that too few of the owners of these unwanted cars get their fair share of the revenue junk cars generate. At a minimum, most junk cars are worth about $100 to $200 in scrap metal. Even if the towing costs $75, these unwanted cars can be worth up to $125 to the towing companies. Worse still is the fact that many people actually pay $75 -$125 for towing, and additional storage fees at times, instead of getting paid for their car. In this day and age, if you have an unwanted car, you should never pay a penny for towing. 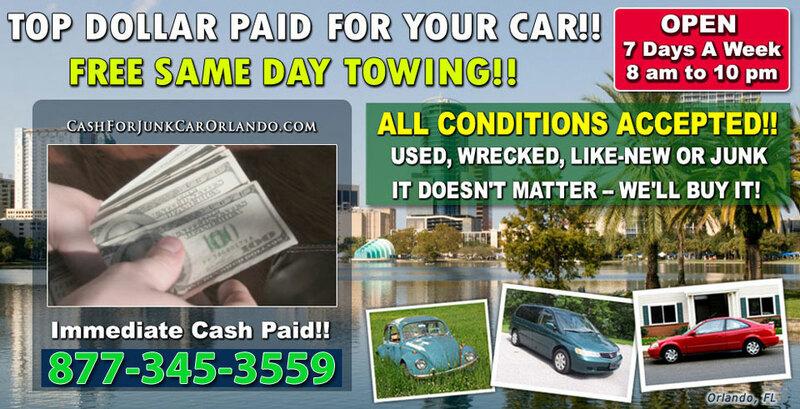 No matter what the condition of your unwanted car, you should at least get free car removal and $50. You may have to do a little research online, but when the difference is $50 in your pocket versus hundreds in towing and storage fees, it's well worth your time. Simply enter your home town name and "junk car removal"into any of the major search engines. Unless you live in a very small rural area, there are likely to be numerous businesses offering free towing and a little cash for unwanted cars. Sell Your Unwanted Car Today! Turn Your Unwanted Car Into Cash Now!